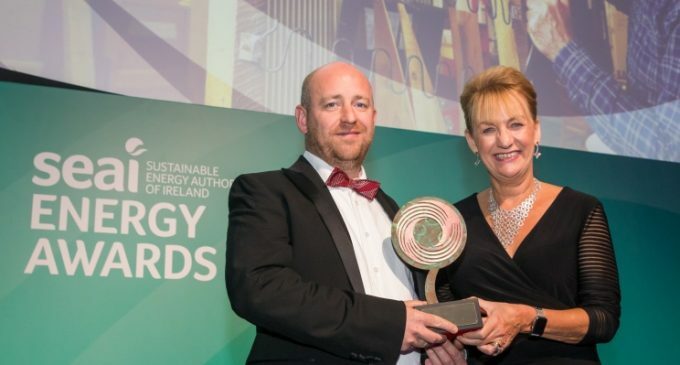 Funded by the Government of Ireland, the Sustainable Energy Authority of Ireland (SEAI) has announced the winners of its Sustainable Energy Awards. The Rediscovery Centre in Ballymun, Dublin received the Buildings Award. The Awards reward excellence in energy management in businesses, communities and public sector organisations. The Rediscovery Centre is a creative space in Ballymun connecting people, ideas and resources for greener living. They repurposed the Boiler House, which once fuelled the largest civic heating scheme in Ireland and UK, and was set for demolition. Throughout the project, opportunities for reuse were given preference. For example, the outside of the building was finished using recycled brick, and cladded with old shutters from the original boiler house. Interior glass and some insulation were sourced from leftover materials from the wider local area regeneration. Where new materials were needed to complete the building, they were sourced as locally as possible. The building is extremely efficient with high insulation levels and natural ventilation. The building is heated through a biomass stove and solar heating. They also generate electricity from solar. The revamped Boiler House demonstrates best practice design, construction and operation. Gurteen College founded in 1947, is an agricultural college offering a range of courses on agriculture and equine studies for farms and rural enterprises. In association with Tipperary Energy Agency, college Principal Mike Pearson developed a renewable energy programme to reduce the impact of energy usage and improve its efficiency throughout college grounds. The centrepieces of the renewable energy technology strategy are a 50kW wind turbine, a solar photovoltaic installation, and a biomass boiler which is fuelled from the 80 acres of willow grown on site providing 80% of the fuel needed to heat the college each year. Wyeth Nutrition commenced operations in Askeaton in 1974, and now employs over 750 people supplying infant nutrition products to a global market. The Wyeth ‘Energy Efficiency Journey’ since 2012 delivered a wide range of verified energy saving projects including building and control upgrades, heat recovery, system optimisations, Lean manufacturing, and more, culminating in the achievement of the ISO 50001 Energy Management standard. It is estimated that the site has saved 49% of its annual energy cost. The Tallaght Community Living Lab was created to research solutions that increase the level of electricity production hosted by communities. It is a collaboration between Micro-Electricity-Generation-Association (MEGA), South Dublin County Council, and industry partner MPOWER who is driving this ‘disruptive innovation’ research towards full commercial deployment. This started in DIT and the Tallaght Living Lab, from where it is aimed to franchise it to local communities acting as ‘Smart Cells’ in an emerging independent Cellular Smart Grid. The ultimate aim is that consumers in Community Grids become prosumers, i.e. producers/ consumers who offer a service back to the energy supply chain. Comharchumann Fuinnimh Oileáin Árann Teoranta, the Aran Islands Community Energy Cooperative, with 100 members is open to every island resident. It is not-for-profit with 12 directors representing every sector of the community. Progress is continuing, and over half of the houses and buildings on the three islands have completed energy upgrades since 2012 and half of the buildings on Inis Oírr have now replaced fossil fuels with heat pumps and solar photovoltaic panels. Inis Mór is also advancing in the same direction with 10 electric vehicles in use on the island. EirGrid Group manages and operates the transmission grid across the island of Ireland. The aim of the DS3 Programme is to meet the challenges of operating the electricity system in a secure manner while achieving Ireland’s 2020 renewable electricity targets. DS3 System Services offers financial incentives for conventional and renewable generation to provide flexible services, enabling an increase in the levels of renewable generation possible on the power system at any given time. Sligo University Hospital provides acute general and maternity services to the population of Sligo, Leitrim, West Cavan and South Donegal and delivers regional services across the North West to a population of 280,000. Since its inception in 2012, the hospital’s energy management programme, consolidated under the SEAI Energy MAP approach, has delivered measured energy savings in the order of 13.5%, and all this against a backdrop of increased hospital activity. The formation of a cross-functional Energy MAP team has been critical to the success of the programme, helping to focus on energy reduction in the hospital departments and instilling a commitment to energy management as an integral part in the operation of their services. Aut Even Hospital is a seventy-one-bed elective, private hospital with an eighteen-bed day surgery unit, located just outside Kilkenny City. The 10-year fully financed energy performance contract between Veolia and Aut Even Hospital is delivering energy savings that outweigh the finance repayments for the hospital. The project also received an SEAI grant from the Better Energy Communities Scheme and the energy performance contract is now driving down the hospital’s energy cost by over 20%. The Rediscovery Centre is the national centre for the circular economy with enterprises using waste and unwanted materials as a resource and raw material for new product design. The centre is Europe’s first ‘3D Textbook’ building, which means that it creates opportunities for high levels of interaction between the users with the building, acting as an educational tool to lead positive behavioural change on resource management and efficiency. The building demonstrates best practice design, construction and operation, redesigned using ecologically sound materials along with a combination of solar-generated heat and electricity, high insulation levels, natural ventilation, CHP and a biomass stove with back boiler giving the Centre an A2 BER rating. Lidl Ireland and Northern Ireland have over 5,000 colleagues across almost 200 retail sites. The company’s sustainable energy programme is a multifaceted approach, where every step of the energy life cycle is being challenged to identify improvements, from end users in stores, all the way upstream to the source of energy supply. The result has been striking with a reduction in carbon intensity of over 50% vs 2016 levels and cost savings of €600,000. The primary driver for the initiative is board level acknowledgment that as a retailer, a sustainable environment is fundamental to future prosperity. The Rediscovery Centre, Ballymun, won the Buildings Award at the SEAI Sustainable Energy Awards. Pictured (L-R): Roger Warburton with Julie O’ Neill, Chairperson of SEAI.